Billy Barnes first enjoyed fame with a series of musical revues. He went on to write special material for Danny Kaye, Judy Garland, Sonny and Cher and the Academy Award telecasts. This album gathers together a collection of songs he has written to order over the years, most recorded by the artists who commissioned them. Enjoyment of the CD will depend on one’s fondness for this kind of material. 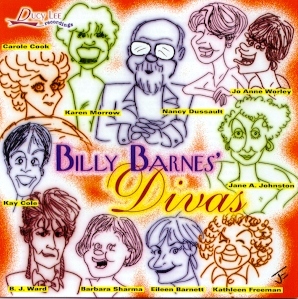 Its tone is somewhat uniform but, at worst, one could only accuse Billy Barnes’ Divas of being perhaps a little too much of a good thing. With one exception, Nancy Dussault’s poignant "Captain’s Daughter," all the songs are humorous. Several exploit Barnes’ particular talent for pastiching other writers’ work, with clever musical quotes or lyric snatches from familiar showtunes. The album’s chief pleasure may be the opportunity to hear these talented women, most of whom are rarely if ever recorded. None of them disappoint. Eileen Barnett is particularly funny on one of the strongest numbers, "The Valley," about a woman who moves to the San Fernando valley with some reluctance but soon finds herself embracing the lifestyle. Karen Morrow gives her all to the seven minute marathon "Show Voice" and Carole Cook enjoys herself to an almost indecent degree as the "Queen of Equity Waiver." Barnes proves himself no mean interpreter of his own material on "Something Special," an attempt to explain his particular gift to the uninitiated. There are a couple of entertaining duets. Barnes and Jo Anne Worley exhibit genuine chemistry on "A Great Idea" and Kay Cole and Barbara Sharma have great fun with "Always A Bridesmaid," the lament of two musical theatre actresses doomed to a lifetime of second leads (‘never Magnolia, Julie’s my role…but being drunk and boring isn’t really my goal’). Cole also shines on a pair of numbers originally written for the late, great Juliet Prowse. Barnes’ own skillful piano accompaniments frame his Divas’ vocals perfectly. His songs – and the women who sing them – are pure showbiz but the material is often deceptively clever and the album will appeal to those who enjoy good old-fashioned entertainment delivered with affection and zest.